A day after signing veteran linebacker Vontaze Burfict, the Raiders are meeting with another former Cincinnati Bengals defensive player. 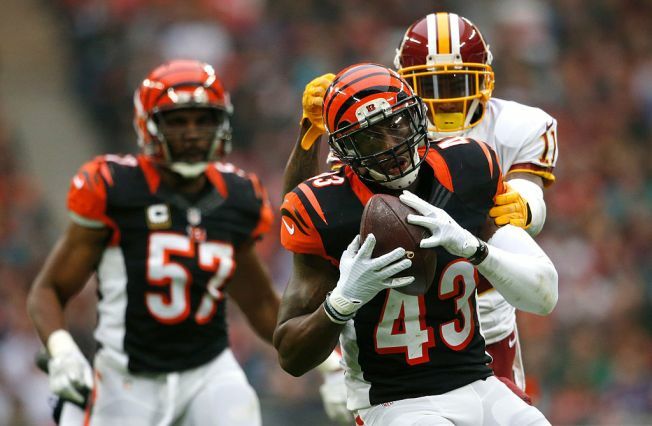 Safety George Iloka was scheduled to visit Oakland Wednesday. Like Burfict, Iloka played several seasons in Cincinnati with former Bengals defensive coordinator Paul Guenther, who came to the Raiders in 2018 with head coach Jon Gruden. Iloka, who played strong safety for the Bengals from 2013-2015, then free safety from 2016-2017, was released by Cincinnati after the 2017 season. With the Bengals, Iloka had been a solid performer. He had nine interceptions and played all 16 games in four of his five seasons as a starter. Kevin Patra of NFL.com noted Iloka was signed by the Vikings last summer after his release, but played a limited role in Minnesota, starting just three games. It’s possible, too, that he could be a backup in Oakland behind free-agent addition Lamarcus Joyner (a former Rams starter) and Karl Joseph. But he could compete for a starting job. “Before being mostly mothballed by (the Vikings), Iloka was a good coverage safety and a solid tackler in the Bengals secondary,” wrote Patra. Iloka, at 6-foot-4 and 225 pounds, might be best suited to playing strong safety with the Raiders.